Malnutrition has been considered a risk factor for the development of a surgical site infection (SSI). The aim of this study was to determine the relationship between preoperative nutritional screening scores and the development of SSI after pancreaticoduodenectomy. We examined 64 patients who had undergone pancreaticoduodenectomy. Their clinical data, nutritional risk index (NRI), and nutritional risk screening 2002 (NRS-2002) score were recorded. SSIs were diagnosed according to the definitions of wound infection established by the Center for Disease Control and Prevention and were confirmed by a microbiological examination. Data were analyzed using the Fisher exact probability method and a multivariate logistic regression analysis. SSIs developed in 21 patients (33 %). Eleven patients had wound infections, and 14 patients had an intra-abdominal abscess. 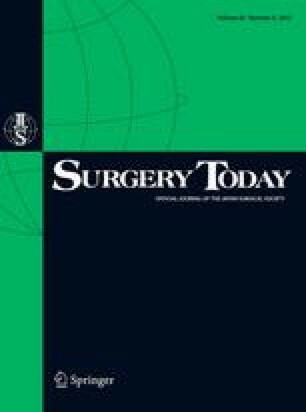 A univariate analysis of perioperative factors revealed that a pancreatic fistula, the NRS-2002, and the NRI were significantly associated with the development of SSI (p < 0.05). The multivariate logistic regression analysis revealed that a pancreatic fistula and the NRI were independent risk factors for SSI. By analyzing the pre- and intra-operative factors after excluding the 11 patients with pancreatic fistulas, the NRI was still an independent risk factor for SSI. The present study showed the NRI to be an independent factor for predicting the risk of SSI after pancreaticoduodenectomy. Hiroji Shinkawa and co-authors have no conflict of interest.